October 08, 2018: Olay has always been committed to understanding the wants, needs and aspirations of all women. 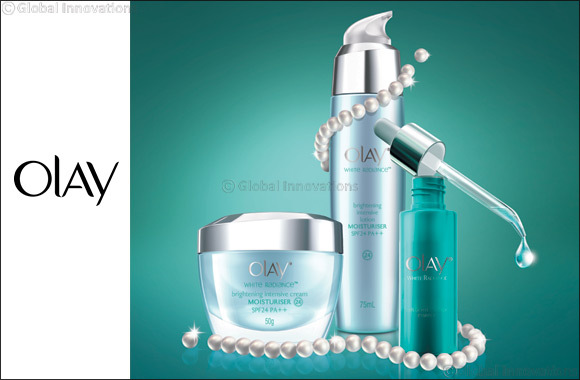 Inspired by the beauty & perfection of a Pearl, a symbol of radiant beauty, Olay has designed the White Radiance Collection, its most advanced tone correcting products to date. Just like a refined pearl itself, skin is precious too, but the similarities between skin and a perfect pearl do not stop there. Like the surface of an exquisite pearl that encapsulates impeccable purity, lustre and luminosity, a woman wants beautiful skin that is radiant and perfect too. A perfect pearl is similar to flawless skin with exceptional radiance, even colour and a perfectly smooth surface; yet many factors such as light, water and pollution can cause a pearl to lose its radiance and for imperfections to appear. Like the Pearl, these environmental factors can lead to skin losing its radiance and cause imperfections such as uneven skin tone and texture. With Olay White Radiance collection, you can fight dull, uneven skin tone, and the appearance of dark spots and dark circles, and achieve a fairer, more even skin tone and pearl-like radiance in just four weeks. The Olay White Radiance range offers advanced tone perfecting skin care products and works up to 8 cell layers deep², for bright radiant fairness. Formulated with an advanced Olay Whitening Active Complex consisting of Vitamin B3, Pro Vitamin B5, Vitamin E and SPF; White Radiance lightens skin from deep within the skin surface, increases translucency by renewing the skin’s outer layer and locks in moisture, so that your fairness can glow through a silky smooth surface. Vitamin B3 is a clinically proven fairness ingredient that helps prevent the transfer of melanin to the skin. A safe & stable ingredient which guarantees brightening efficacy for any women, it increases cellular renewal rate to improve overall skin tone. Honeysuckle flower, natural antioxidants + moisture complex protect the skin from environmental damage and correct dull complexions for fairer, more radiant skin, while restoring skin moisture levels & strengthening barrier function. SPF 24, with UVA + UVB filters, helps protect against UV damage, and defend against skin darkening and the appearance of dark spots.